A 23-year-old driver with a blood alcohol content 2-1/2 times higher than the legal limit ran a red light and collided with a 19th District police patrol car late Thursday in Lakeview, according to CPD. Video shows the patrol car stopped for a red light, facing eastbound on Belmont at Ashland at 11:57 p.m. When the officers' signal changes to green, the patrol car enters the intersection. Less than a second later, the allegedly intoxicated driver’s Honda Civic runs the southbound red light on Ashland and slams into the side of the police SUV. 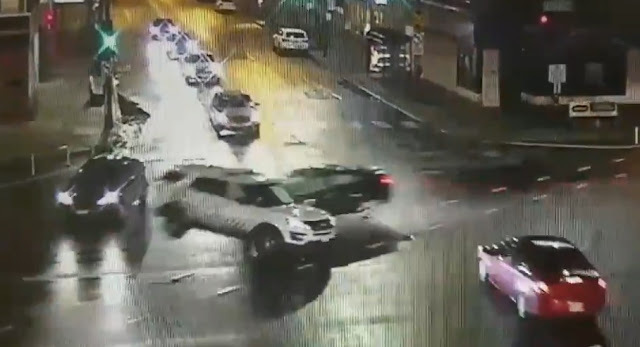 The impact caused the patrol car to spin nearly 360-degrees and slam into another car that was being driven by a 28-year-old woman. She was not seriously injured. Both officers involved in the crash were taken to a local hospital: The driver suffered pain in their leg and arm while the passenger had “overall pain to the body,” according to a police department statement. The driver, whose blood alcohol content was .205 according to police, is being treated at Northwestern Memorial Hospital.